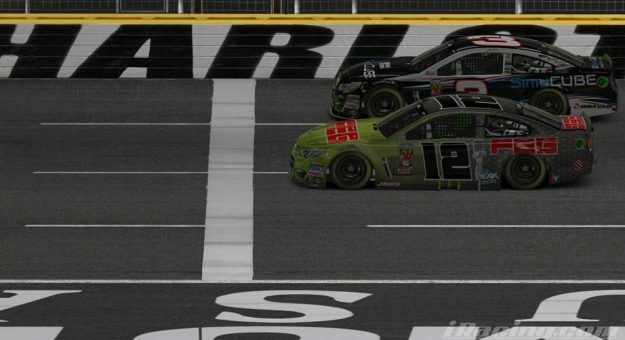 Nick Shelton scored his first victory of the 2018 NASCAR PEAK Antifreeze iRacing Series, after edging ahead of Jarl Teien in Turn 4 on the final lap. The two battled side-by-side to the checkered flag with Shelton winning by just .007 seconds. The thrilling finish capped off a wild final 50 laps that saw seven crashes and the dominant cars finding trouble. Polesitter Christian Challiner led the first 13 laps, but Keegan Leahy surged ahead as he looked like one of the cars to beat for the second week in a row. The first 81 of 200 laps ran caution free allowing Leahy to build his lead. As the run wore on, though, Alfalla started to cut into the lead. Leahy, who had also been closing on the leader, chose to pit on Lap 146. The early stop would have surely cycled Leahy to the lead, but a yellow flag on lap 150 trapped him a lap down and forced him to take the wave around to gain the lap back. The last 50 laps were quite chaotic with multiple crashes breaking the race into short sprints. Clampitt survived the first restart, but his race came undone on Lap 165 when another crash brought the leaders back to the pits for fresh tires. The leader overshot his pits and struggled to reverse, costing himself valuable time. In all, Clampitt lost 11 positions in the pits and would not challenge the leaders again. Teien held the lead on the penultimate restart, which saw Gilliland and Schoenburg meet their demise. The race came down to a two-lap shootout with Teien getting a near-perfect restart to jump out front over Shelton. However, Shelton had the quicker car and by the time the duo took the white flag, Shelton was right on the leader’s bumper. Shelton made his move in Turn one, but could not complete the pass. He was still alongside Teien entering Turn three, giving him the preferred bottom groove. Giving it all his car had, Shelton got a great run through the middle of the corner, edged ahead, and won by inches. With seven races remaining until the playoffs, the series heads to Michigan International Speedway for Week 8. Just a few short weeks ago, it appeared Luza and Alfalla were the only two with a realistic shot at the title. However, Luza has seemingly disappeared and Alfalla has looked vulnerable in recent races, with Leahy and Clampitt both having more speed at times. Will the trend continue? Or can Alfalla get back to victory lane at Michigan?